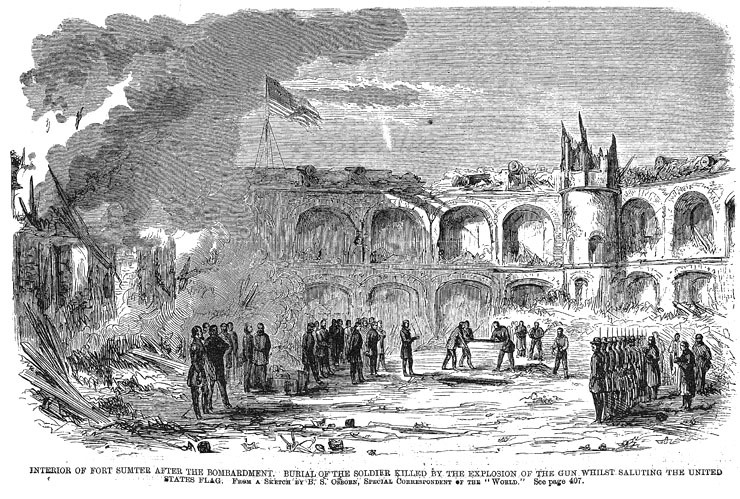 Caption: Interior of Fort Sumter after the Bombardment. Burial of the Soldier Killed by the Explosion of the Gun Whilst Saluting the United States Flag. From a sketch by B.S. Osborn, Special Correspondent of the "World." Source: Illustration from New York Illustrated News, May 4, 1861, page 412. Although there were no fatalities in the battle itself, the U.S. Army's withdrawl included a 100-gun salute to the American flag, during which there was an explosion. One member of the gun crew was killed, and the rest were injured.